I have been so happy with my decision to feature a crockpot cookbook as the cookbook of the month for August! You know how that saying goes August is the hottest month of the year (ok well maybe it is not a “saying” just factual information based on science and history)? Well, this year the weather is backing that ole saying up! Yesterday we reached a scorching 107 degrees and rumor has it that today’s temps have been the same! That is the hottest all year! Man Mother Nature herself must have been taunting me and trying to make me fell like there was no escape from the heat… but I am totally showing her and continue to charge ahead crockpot style and I am not looking back! 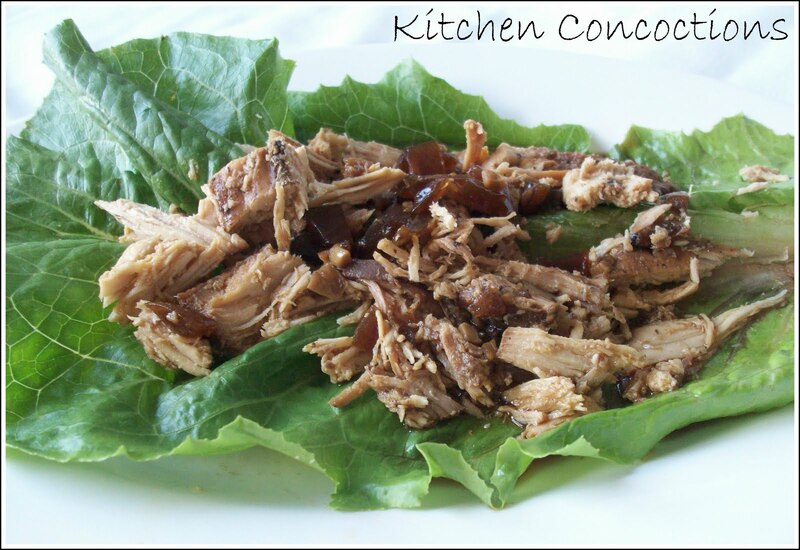 Not only is using of the crockpot keeping my house cool, today’s recipe is light yet filling, so you won’t get that uncomfortable feeling of being weighed down by dinner and the heat. Plus, with heat like this I guess pool and swim suite season is here for a bit longer and that definitely calls for a ‘lighter’ dinner. These lettuce wraps did just that. They were light and refreshing, yet I was full after just 3!. This chicken had great flavor and made a perfect filling for our lettuce wraps. Eric and I even thought this chicken would be good served over rice or with a side of these noodles. Notes: We really liked this dish a lot and it was so incredibly easy! Next time I make it though, I will add in some water chestnuts to add extra ‘crunch’. Also the original recipe called for wine but I used chicken stock instead. Oh and one more tip. In the original recipe the directions say to cut the chicken up raw and let the the chicken pieces cook in the crockpot. I skipped this step due to being short on time in the morning before work and just threw in whole chicken breasts and shredded the meat after it was cooked. So do what works best for you! Cover and cook for 4-6 hours on high, 6-8 on low.